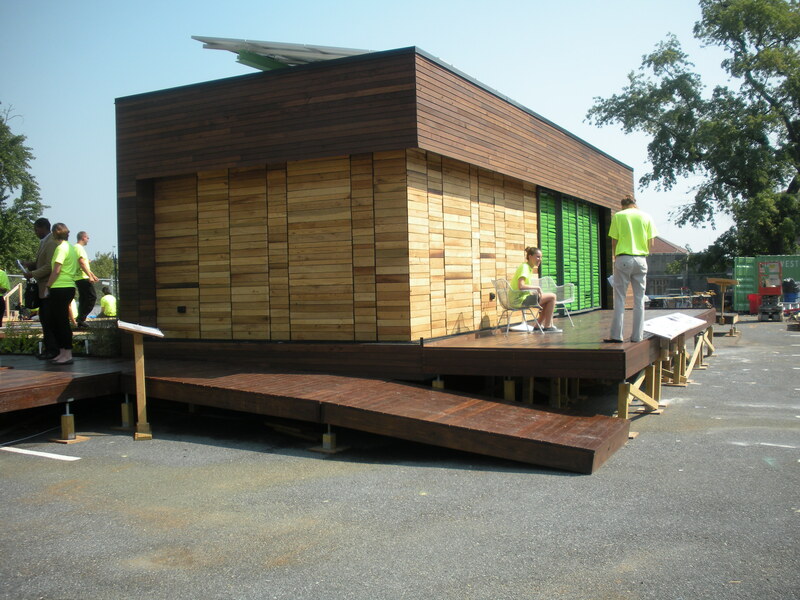 A solar-powered house designed by students from three D.C. universities placed 7th among 19 entries today in the 2013 Solar Decathlon competition. The biennial contest, held this year in Irvine, Calif., challenges collegiate teams from around the world to design and build solar-powered homes that are cost-effective, energy-efficient, and attractive to home-buyers. First place in the contest, which is organized by the U.S. Department of Energy, went to Team Austria from the Vienna University of Technology. After the Solar Decathlon’s final public tours tomorrow, Harvest House will be donated to Wounded Warrior Homes, a San Diego-based non-profit organization that provides transitional housing for military veterans suffering from traumatic brain injury and post-traumatic stress disorder. When rebuilt on a permanent site in Vista, Calif., Harvest House will become the home of an Iraq-war veteran, identified only as Travis, who has PTSD, and his service dog, Gibbs. Litter blog toured Harvest House at its initial construction site on the campus of Catholic University before it was disassembled for transport to California. Our guide was Sarah Buffaloe, a Colorado native who earned a degree in architecture from Syracuse University before starting work on a master’s degree in sustainable design at Catholic University. Harvest House’s frame consists of two steel modules specifically designed so they can be transported on flatbed trucks. The modules also were engineered to withstand Southern California earthquakes. Some 89 percent of the frame is recycled steel, and many other materials for the house were reclaimed from deconstructed buildings. A 100-year-old Methodist church in Ohio was a primary source of wood for the siding, floors, and exterior deck. Additional wood came from a deconstructed barn in Poolsville, Md., and soft tiles on part of the deck were made of recycled rubber from tires. Inside the house, materials were selected to minimize the occupants’ exposure to toxins. Water pipes are polypropylene, not the more common polyvinyl chloride, which may leach harmful chemicals. Bathroom tiles are porcelain that does not emit volatile organic compounds. Bedroom cabinets were made in-house by Team Capitol DC using bamboo certified by the Forest Stewardship Council and “which meets the most stringent California requirements for emissions,” said Buffaloe. Harvest House is solar-powered, of course, with 32 245-watt photovoltaic panels generating 6.8 kilowatts of usable electricity. The house is designed to be “net-zero” – producing all the energy it needs without pulling from the electrical grid – and eventually net positive. During the week-long Solar Decathlon competition, Harvest House produced 91.9 kilowatt-hours of positive net electrical energy. When occupied and electrical appliances are in use, its solar panels are expected to generate 10 percent more electricity than the house needs, according to Buffaloe. Multiple design features of the Harvest House conserve the electricity produced by its solar panels. All light fixtures use LED bulbs, and the house has a high-efficiency air-to-air heat pump for heating and cooling. Air is supplied to floor vents that produce a helical flow. “[I]t works with convection to circulate air throughout the space directly where the occupant will feel it, so it’s a more efficient system,” said Buffaloe. The entire house and its ventilation ducts were pressure-tested for leaks, and an infrared camera was used to reveal heat infiltration. Test results guided the students in tightening the building envelope and ducts. Double-pane windows, with argon gas between the panes, are strategically placed for passive ventilation so that warmer air from the sun-exposed south is drawn by convection to the cooler north. An innovative screen on the southern side of the Harvest House contains “memory wire” that closes the screen to shade the house as it heats up, then opens the screen as it cools to let in sunlight. The memory wire requires no electricity for its operation, and the screen is on a track so it can be opened for ventilation. Placement of the screen on the south side of Harvest House is just one example of how the building’s design accounts for the position of the sun. “The idea is that you occupy the house throughout the day to move with the sun,” said Buffaloe. To the east, directly off the bedroom, is the “morning deck.” An occupant can enjoy coffee on the eastern deck while basking in the warm morning sun, then move back inside, where filtered midday sunlight enters from the south. In the evening, as the sun sets in the west, dinner can be taken at the “harvest table,” the main feature of an expansive deck on the north side of the house. In the center of the harvest table are live greens and herbs on either side of a narrow rivulet of running water. A "popup garden" fashioned from milk crates on the deck of Harvest House allows occupants to grow some of their own food. Together, the two decks double the useable living space of Harvest House and contain a garden of edible plants grown in milk crates. Each crate is filled with a mix of topsoil and coir, a coarse fiber from the outer husks of coconuts. Irrigation for the garden – an important consideration in Southern California, where annual rainfall is only two inches a year – comes from a cistern that collects rainwater from the roof and from graywater collected from the sinks and shower. Harvest House is one of nearly 100 test projects for the latest version of LEED certification, which will be launched next month. 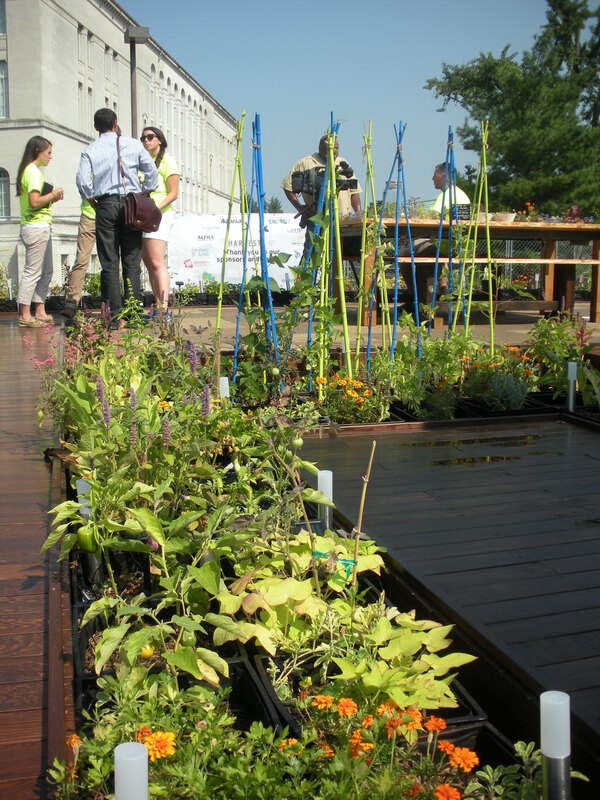 Litter blog thinks a lot of good decisions went into Harvest House and congratulates Team Capitol DC on a strong showing in the 2013 Solar Decathlon! Wayne Savage is the owner of Mid-Atlantic Litter Cleanup Service, a Washington, D.C.-based litter-removal company. This entry was posted in Solar Decathlon by Wayne Savage. Bookmark the permalink.